Theresa May sets out her view of what kind of country she wants Britain to be. Theresa May's speech - image, number 10. This sets her face against any constitutional reform at this moment of profound change. We are not going to update the UK or become a modern country with a written, democratic constitution. We will stay as we are. The reference to coalition is a signal to her own party that we don’t want any more of that if we can help it – and there will be no change to the voting system. It is also an aggressive push back against Scotland too. She is aware of this vulnerability. Hence the extraordinary threat that she made, behind her smiling pitch for a free trade agreement. Agree, or it will prove to be “an act of calamitous self-harm for the countries of Europe”. Because if the EU does not do as she wishes, it “would jeopardise [its] investments” in Britain as well as its trade with “one of the biggest economies in the world”. So there! The more significant incoherence is institutional. 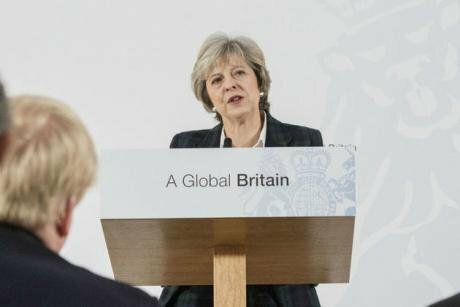 Whatever the tensions in negotiation with the EU, Global Britain, she says, will be unified at home, “Because after all the division and discord, the country is coming together”. In May’s view, “The referendum was divisive at times. And those divisions have taken time to heal. But one of the reasons that Britain’s democracy has been such a success for so many years is the strength of our identity as one nation…”. Hold on, "one nation"? This is the same person who in the same speech refers to “the 4 nations of the United Kingdom” and our “union of nations” has collapsed them into one? Some cognitive dissonance. One nation style unity is on the way because, “the importance we attach to our institutions means that when a vote has been held we all respect the result. The victors have the responsibility to act magnanimously. The losers have the responsibility to respect the legitimacy of the outcome. And the country comes together”. This is a very striking claim. May supported Remain but she speaks here as if she is a victor. But where is the magnanimity? the word implies not simply telling the losers to accept the outcome, but stretching out to them with some concessions to meet their concerns. Yet she makes not the slightest concession to anyone this side of UKIP. This is not a formula for coming together or unity. After May made her first speech about Brexit in October last year, I showed how the Daily Mail had taken power. When they are magnanimous, she will be. Until then, if you are not with her, you are an enemy of the people. The media understandably focused their response to the speech on the big story of what Theresa May is saying about Brexit. But her setting out “what kind of country we want to be” is as important. At the start she heralded a “great moment of national change”. Yet she is not proposing that Britain changes the way it is governed one bit. Instead of offering the Scots a federal settlement, giving the English who drove Brexit a voice (see Nicholas Boyle’s recent philippic), proposing an inventive solution for Northern Ireland, and acknowledging that London, a world city with its own directly elected mayor, voted to remain by 60:40, she insists we can make our greatness global and appears to want to take the country back to 1971, if without its then troublesome trade unions. Her Daily Mail approach has led the prime minister to place too much emphasis on firmness. What works for a headline does not good policy make. Every holder of her office is now haunted by the way Margaret Thatcher reshaped the country. But Thatcher's conviction was harnessed to a formidable programme of genuine domestic transformation and a new culture of government, whether you liked it or not. There is no such depth to May’s announcement of her beliefs. Anthony Barnett is writing THE LURE OF GREATNESS: England's Brexit & America's Trump which can be pre-ordered here.